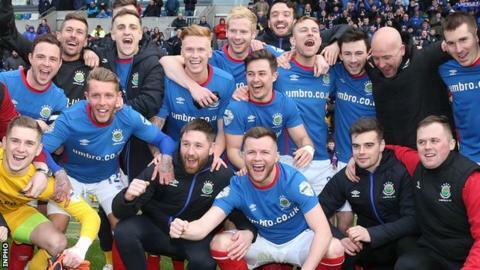 Linfield have secured the Irish Premiership title with a 0-0 draw at home to outgoing champions Crusaders. David Healy's Blues were actually sure of the title minutes from the end as news came through that second-placed Ballymena had drawn at Cliftonville. It was a record 53rd top-flight title for Linfield who finished fourth in the table last season. Coleraine drew 1-1 at Glenavon while Dungannon beat Institute 2-1 and Ards were held 1-1 at home by Glentoran. Linfield could well have clinched the title with a victory as they got a second-half penalty for a hand-ball by Crusaders skipper Colin Coates. But Jordan Stewart saw his spot-kick well saved by goalkeeper Ger Doherty. In the end it did not really matter as a 21st clean sheet of the season ensured another trophy for Northern Ireland's most decorated club. "The most important thing was getting over the line. The older you get the more you cherish these moments," said Linfield striker Andrew Waterworth who turned 33 on Thursday. "This is my third league and it is a great feeling. It is a huge weight off my shoulders." Glenavon's run of four straight league wins came to an end as Ben Doherty's late strike salvaged a draw for sixth-placed Coleraine. Doherty swept a low left-foot shot into the corner of the net past Jonny Tuffey with a minute remaining to give the Bannsiders their first point in three games. Jamie McGonigle squandered a chance to put the visitors in front when Tuffey saved his first-half penalty after the striker had been upended by Eoin Wearen inside the area. Sammy Clingan fired home from the penalty spot six minutes after the interval, the spot-kick awarded when Stephen O'Donnell brought down Stephen Murray. With their title hopes over, Ballymena United had to settle for a 1-1 draw away to Cliftonville. Ryan Curran's deflected effort put the Reds in front after just three minutes before Johnny McMurray struck an excellent equaliser for the Sky Blues. The visitors looked dangerous in the first half and had two goals disallowed for offside, with Kofi Balmer and McMurray both having strayed beyond the last man. Unfortunately, the second period transpired to be a lifeless non-event, with the only noteworthy action coming on the touchline with Ballymena skipper Jim Ervin and Cliftonville boss Paddy McLaughlin involved in a scuffle. Dungannon Swifts kept alive their hopes of finishing seventh in the table as they ended a run of three straight defeats by beating Institute 2-1 at Stangmore Park. Daniel Hughes fired the Swifts ahead on 54 only for Ronan Wilson to lob an equaliser three minutes later. However, substitute Paul McElroy secured the points for Dungannon with a 75th-minute penalty after Ryan Morrow had been adjudged to have handled a Michael Carvill cross. Ards briefly moved off the foot of the table on goal difference after a 1-1 draw with Glentoran but it was short-lived as Newry City later moved three points ahead of Warren Feeney's side following their 4-2 away win at Warrenpoint Town in the early evening game. Early strikes from Karl Moody and Darragh Noonan put Newry 2-0 up at Milltown and it was 4-0 by half-time following two John Boyle goals. Despite Seanan Foster's red card for a poor challenge on Mark McCabe, Warrenpoint reduced the margin to 4-2 with 20 minutes left after goals from Josh Lynch and Danny Wallace. However, Hermany Marques' dismissal after he received a second yellow card for hand ball saw Point reduced to nine men and Newry held on to clinch all three points. In Bangor, Glentoran were made to pay for a number of missed first-half chances when Michael McLellan bundled Ards ahead from close range on 54 minutes. But the Glens levelled on 80 minutes when a goalmouth scramble looked to go in off Ards defender Calum Byers before Robbie McDaid made sure, while Ards finished with 10 men after defender Johnny Taylor was sent off. The defender got a second yellow card for kicking the ball away after a free-kick had been awarded.